"The true voice of the Yankees." During his fifty years in the broadcast industry, the late Mel Allen covered 20 World Series, 24 All-Star Games, 14 Rose Bowls, 5 Orange Bowls, 2 Sugar Bowls, and did over 2,000 newsreels. After winning an audition with the Columbia Broadcasting System in 1936, Allen went on to broadcast the World Series for CBS in 1938. He joined the Yankees the following year and stayed for twenty-five more, delighting millions of baseball fans with his warm sign-on -- "Hello, everybody!" -- and his trademark phrases -- "How about that!" and "Going, going - gone." Allen moved to the Milwaukee Braves in 1965, went on to broadcast for the Cleveland Indians and handled a variety of assignments for NBC. 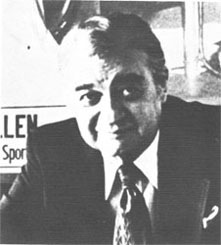 In 1978, the "Voice of the Yankees" returned to New York as a member of the SportsChannel announcing team. Allen's more work as the Voice of This Week in Baseball introduced his style to still another generation of fans.